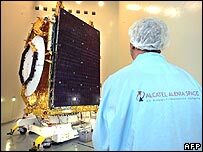 French defence firm Thales has bought the satellite unit of phone equipment firm Alcatel for 673m euros (£471m; $825m) and a large chunk of its shares. The move comes after France's Alcatel agreed to merge with US rival Lucent, a deal that had posed security worries. Alcatel's sensitive satellite unit will now remain in French hands, echoing a similar move by Lucent, which set up a US firm to handle government contracts. The French Government holds a 27% stake in Thales, while Alcatel now owns 22%. A recent spate of consolidation in a number of industries has put governments on their guard over the possiblilty of losing national control over strategic assets. Politicians in the US recently tried to block the sale of P&O to Dubai Ports World, citing worries that a foreign firm would oversee ports in key cities including New York and Miami. France also has flexed its muscles in past months, putting a spanner in the works of any bid for utility Suez by unveiling plans to merge it with Gaz de France. This marriage of convenience was prompted by rumours that Italy's Enel may be planning an approach, and came after France had also moved to protect steel firm Arcelor from Indian rival Mittal Steel. Alcatel's agreement with Thales seems to have eased French concerns. "French Government representatives indicated that, given the commitments made by Alcatel to respect national strategic interest, the merger envisaged between Alcatel and Lucent does not put into question the strategic partnership concluded with Thales," the companies said. To finance its purchase, Thales said it would issue 26.67 million shares to Alcatel. It added that the deal would not lead to job losses and would boost sales by 2bn euros in the first year. Total savings from the purchase are expected to be close to 50m euros by 2008. Over the weekend, Alcatel said it would merge its telecommunications activities with those of Lucent in a deal valued at close to $14bn. The deal - announced on Sunday - will result in 9,000 jobs being cut across the two companies, representing 10% of their combined workforces. Alcatel will hold 60% of the new firm, which will have sales of about $25bn putting it on a par with industry-leader Cisco.